Discussion in 'Football Forum' started by golden_blunder, Nov 3, 2018. Yeah, had a great game. Also quoted at £80m for us. Amazing concept buying low selling high West Ham have discovered. And agree. Pacy and a baller. Another one that is hurting me more right now is his colleague Marko. He is a monster at the moment.. bullying everything and bringing people into play. His centre forward style would be a dream for us to bring the likes of Pog and Tony into the mix. Has a real fire in his belly at the minute. Works especially well with stadium deals. I've been to watch West ham a few times this season, and though he hasn't been great at times, you can see he has quality. Typically, quite alot of West ham fans don't seem to rate him and think he is a waste of money. I think they would prefer a team of Mark Nobles running around, giving 110% but lacking skill. He needs a coach to press him all the time. He will not get depressed if the coach say he is playing awful, instead he will improve in the follow games. Then he will back to comfort zone again. Since his time at Santos when his former manager Muricy Ramalho used to call him "sleep Anderson", he only will perform if you insult him a little bit. Strange character. As expected, West Ham have got a gem and Lazio have lost their outlet. I know Lazio were in for some trouble when they sold him. At times last season as a #10, he was picking the ball up from deep and coasting past players with absolute ease. L.Alberto was their most important player, and Immobile and Savic were excellent, too, but you can't replace what he offered them after coming back from injury. He was like a new player compared to how he was before. Correa looks promising and is quite similar - works hard defensively, productive, can retain the ball when pressed, can dribble. That said, F.Anderson was on another level so it'll be a while before they fill the gap he's left. He's doing great as a wide playmaker, but I still think he's a central forward. A 10 or 9. He's absolutely lethal there, and I hope Pellegrini uses him there eventually. I wanted us to sign him under LVG. Think he's a classic Mourinho winger. 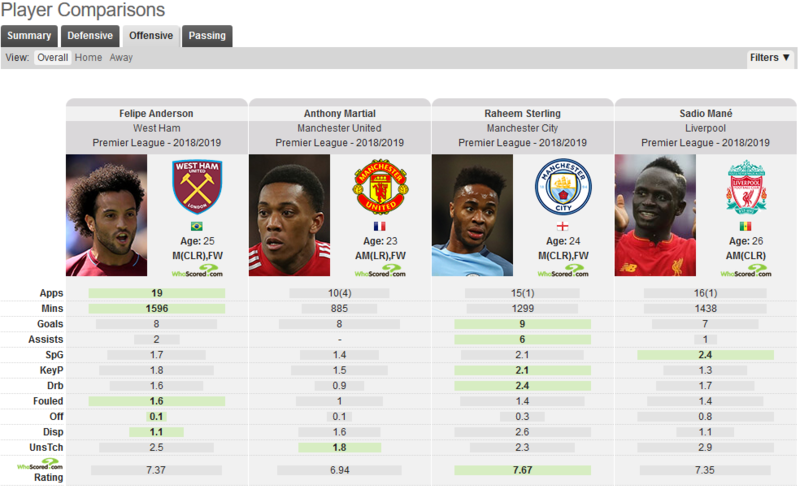 Work rate, pace and very good at carrying the ball from deep areas. He's too good for West Ham. A season to settle here and he'll be moving to a bigger club making West Ham a lot of money. Van Gaal wanted him in 2015. I don't see him as Mourinho type. First game away to Liverpool I thought he was awful tracking back and helping the FB and that's a big red flag for Mourinho if his wide players don't constantly come back and help out. His quality in final third is obvious though. West Ham give him free role like with Payet a few years back. Jose doesn't seem to think so. As we could've had him if we'd wanted him in the summer. Much more than decent, looks completely out of place at West Ham in my opinion. I was expecting him to move to a better serie A team but looks like he moved for the PL money. Very good player! Wouldn't surprise me if a big club comes in for him soon. Easily good enough to regularly start for a top 6 club. I would have liked him here however we already have a multitude of options on the left-wing. He’s played right side plenty. Tonight has been a training session for him. Nothing more. He’s a good player and I didn’t expect this from him. Oh he has? At Lazio? We should be in for him then I think. Too good for those cnuts. Any team planning to take him would need Lukaku money. See this ending the same way it did with Payet for West Ham. But instead of Marseille it'll be a top 6 team. Good player. historically its been his lack of consistency that might have been an issue for top teams. he seems to have addressed that this season. We were rumoured to be interested in him at about 40m. for a long before he went to West Ham not sure what he is like but trust us to wait for some lower club to get him 38mE and then us to be linked for over double the price. We should have got him the first time we were linked, he was class back then too. Im beginning to have the same feeling mate. I don’t get it to be honest, done feck all the whole first half and apart from the goals in the second, again done nothing. Dare I say a luxury player? Currently 8 goals in the PL. When United were linked with him people argued that he was inconsistent (which was fair enough) and that he wouldnt suit the premier league. This is his potential (if it isnt already) breakthrough season and wingers with the capacity to create and score surely have to be on the radar of many clubs. You're getting a player proven in the PL with a lot of uncertainty about adjustment to the league removed. Stands to reason he'd cost more. I think if Ole will be our manager next season, he will suited in our right winger. Top notch shooter in PL. I do understand this factor. That he's proven in the league and that West Ham deserve to make a bit of cash for being the ones who had the balls to fork out the initial outlay. What seems mad is that they have seemed to done their homework to get him for a fee which isn't cheap but is very reasonable these days. What I am trying to say is why don't we seem to get these types of players before someone else does and their value sky rockets? Maybe we didn't want to potentially get stung for a player that could have flopped. Can anyone one think of another reason please? 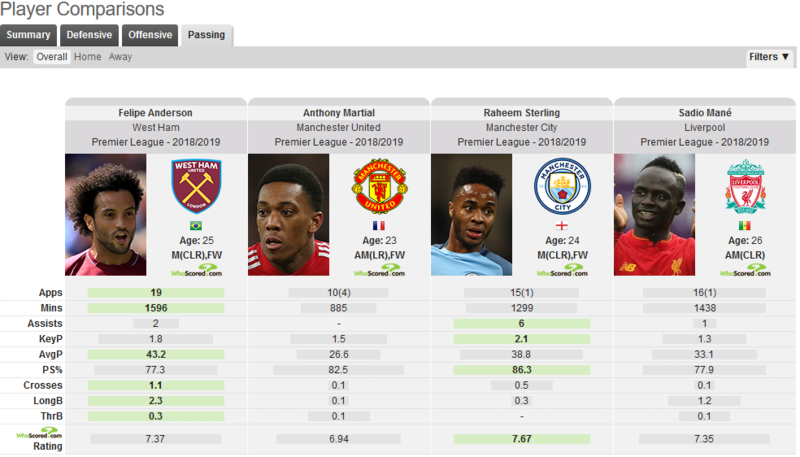 These do factor in sub appearances however, so Martial's numbers are probably slightly down on if we count his starts alone like Anderson. Twice the game-time to reach the same amount of goals. 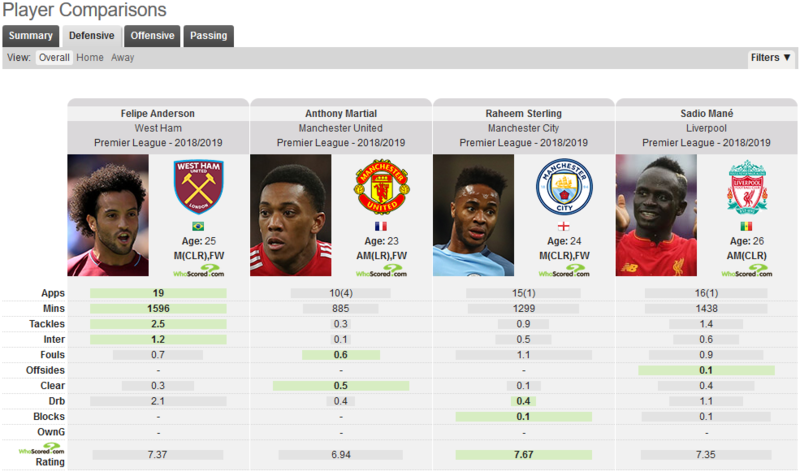 You can say he's more balanced and would be liked more by Mourinho or other managers looking for hard defensive-workers, but that doesn't make him better than Martial. 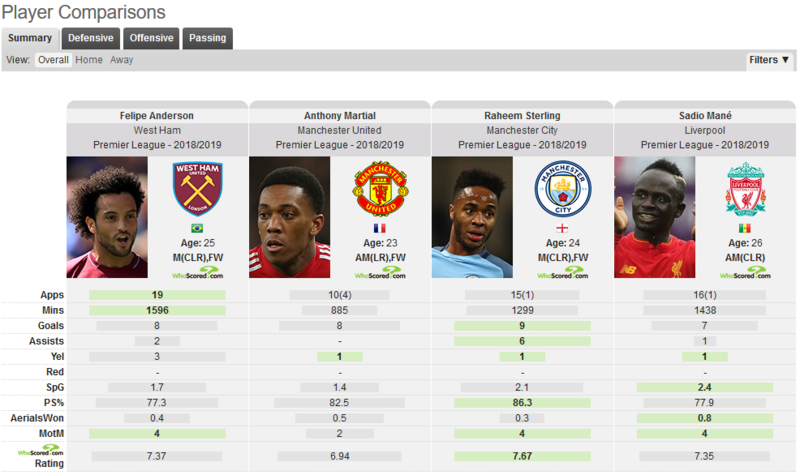 Martial by the way has the best goal per minute ratio in the league this season (at least he did before the last round) alongside a few other statistics that shows efficiency, such as how many shots are needed to get a goal. We can speak truck load of problems about LVG but he does know when and how to spot a talent.